Without making the space more complex, we change the existing one-dimensional depth spatial quality and simplify the space-eliminating the effect of columns on the painting viewers. On some specific exhibition walls, through some well-designed holes, the most original perspective theory of painting is used to compress the space behind the wall and the paintings behind to the two-dimensional front wall. In this way, the viewers can see paintings in front of him or in the distant or middle view. Viewing from the opposite angle will result in the same effect. When there are people passing by behind the walls, people and paintings together become the objects of front viewers, freeing them from the monotonous viewing experience. People are also part of the elements to be considered in the space strategy. 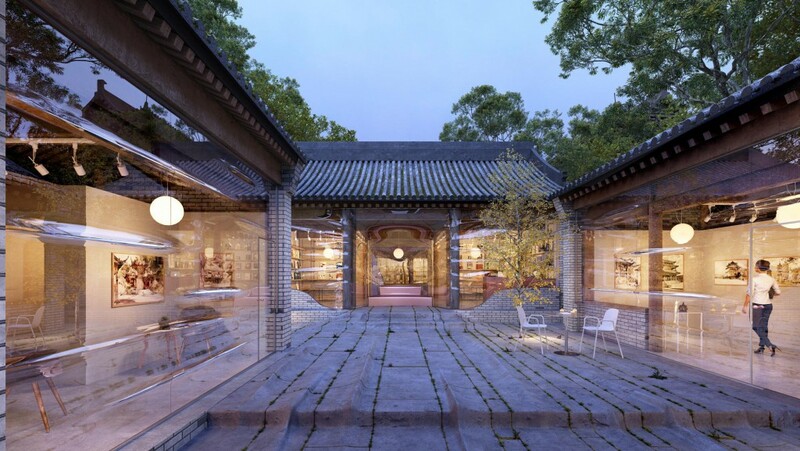 This has always been the “borrowed scene game” in Chinese gardens, except that in this exhibition design, the features of multiple picture frames are further strengthened, suggesting the spatial sense of hierarchy and attracting people to further appreciate the space. The design of multiple paths also give people more freedom to choose their paths and allow them to see all the exhibits at once without having to go back.